Last night, we did go into the town of Ontonagon to have dinner, which consisted of a pretty strange pizza and a warm root beer…Afterwards, the sun was just setting so we got out our cameras and spent some time catching an interesting sunset – huge pink rays escaping from dark clouds and lighting both the sky and the water. On the drive back to the motel, the entire sky was flashing with lightning. No rain though, so we walked down to the beach. 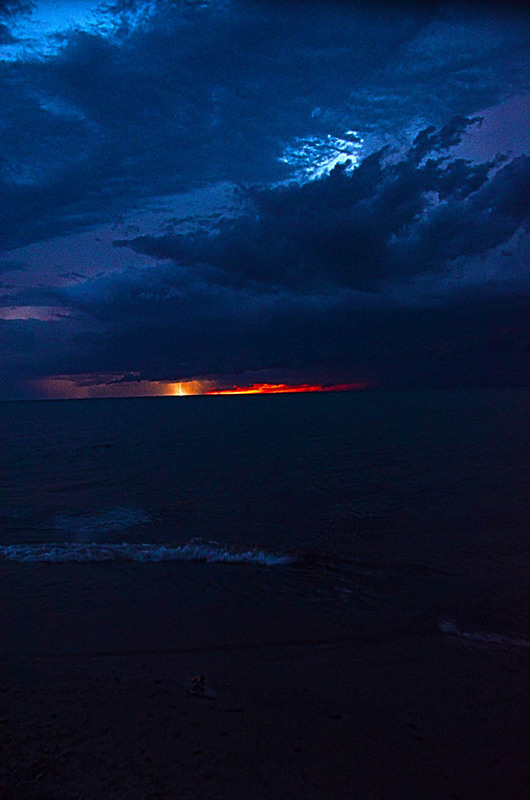 … the storm over the lake to our right. Well, if we learn one thing from the Olympics it is that when judging and assigning scores, you need to leave yourself enough room above and below the first contestant’s score to allow proper scores for the competitors that will come after. I used so much hyperbole to describe what we saw on Monday that I am now at a loss for the proper superlatives to describe what we saw Tuesday and Wednesday. Tuesday morning, we went back into Ontonagon to Syl’s café for breakfast (it’s renown) and found ourselves amidst “cell phones and seed caps”! It seemed so incongruous that all these weather-worn men with their seed caps and “yooper” (as in U.P.’er – this is the Upper Peninsula of Michigan, for those of you who aren’t familiar) drawls have modern smart phones! The Enchanted Forest around the Union River. Our first stop, once back in the park, we almost didn’t make. What a shame that would have been. We set out for a short little hike on the Union Mine Interpretive Trail, supposedly a 1 mile walk. Forget the interpretive signs; they’re just a distraction from the enchanted forest we entered.In a previous life, I must have been an elfin princess. (Who is going to imagine herself an elfin peasant?) I could imagine myself playing on mossy hillocks, flitting through lacy ferns, dancing in sunbeams with a bumblebee: Queen of an enchanted forest! Here, the forest was dark. Sunlight streaming through the occasional break in the leafy canopy seemed like an exclamation point: Look at this! A thick carpeting of pine needles and old leaves, wet from last night’s rain, muffled our steps as we wound around roots and rocks following the course of the Union River. Everything was green. Even the air! Moss in abundance, leaves overhead, ferns like feathery fans, everywhere green, wet and quiet. 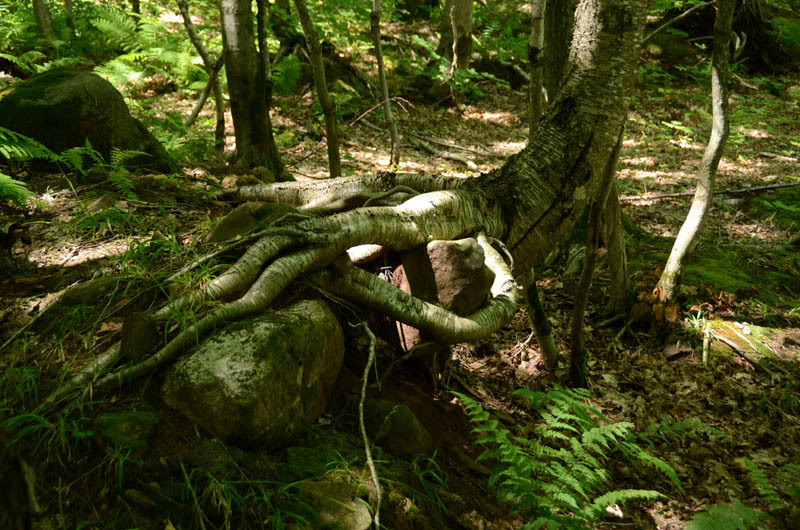 Funny branched trees – this one grabbed a boulder. Hoping for an explanation of how this happens. We climbed up to the top of the observation tower, and most notable at the top was our conversation with the other people up there. We climbed up with a couple from Ann Arbor (he was originally from Mayaguez) and when atop met three brothers (all very early 20s) who were into their 4thday backpacking through the park. We all traded stories of the wondrous things we had seen – and hadn’t seen (like animals – though stories of hearing animals in the night were pretty common). We had all enjoyed the lightning show of the previous evening, though Gerry and I were the only ones who weathered the storm with a real roof over our heads. View of Mirror Lake from our luncheon bridge. Leaving our new friends, we began the day’s real hike, striking out for Mirror Lake. Again, the forest itself is a marvel that defies adequate description. We discussed why we found it so special, and finally settled on the “old growth” label. Now old growth doesn’t mean just big, old trees. 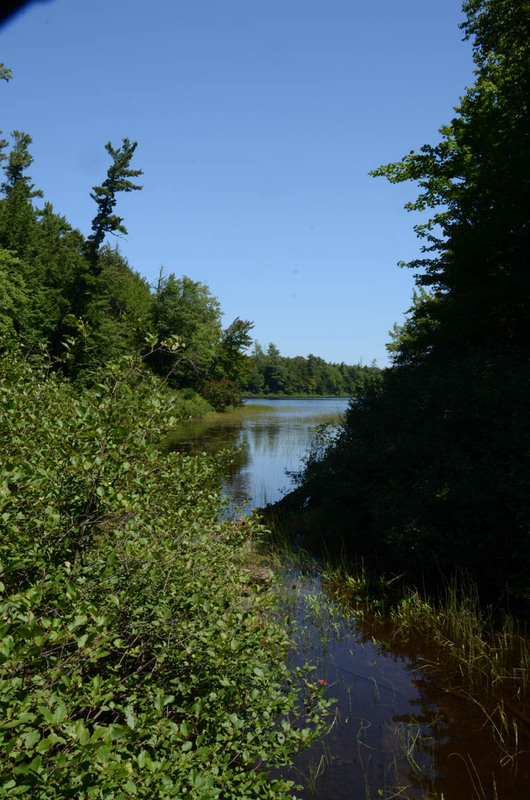 It actually refers to a “mature forest” – one that obviously has big, old trees, but also has lots of dead wood on the ground, young trees and saplings, a diverse vegetative ground cover, spots of sunlight, thickets of dense growth. In a word: variety. 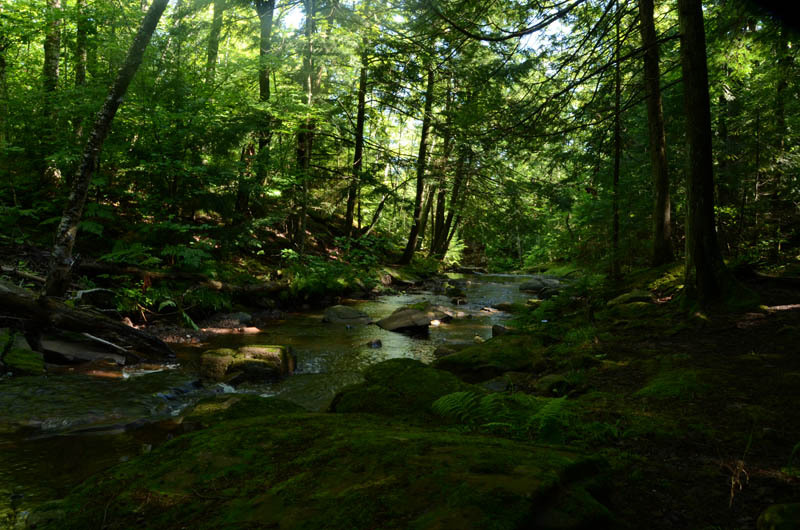 There were distinct ecosystems within the forest too – hemlocks dominate in some areas, birches in others. In some places, the ground is very rocky and, in others, wet. It was never boring, never uninteresting.Probably the most puzzling thing we saw were trees that looked as if they had grown down to the ground (like the boy in The Phantom Tollbooth, which I happen to be reading right now.) What was growing down into and through the earth looked like branches, rather than roots, and as a result the trees were lifted up above the ground. I asked one of the park attendants about them, but got no answer. Check out the pictures and if you know what is going on, please let me know. As usual, some days and other obligations have intervened in the process of writing this journal and I find myself in the position of having to go back mentally and recreate. Fortunately for you, that is bound to make me shorter winded! I last left off describing our hike to Mirror Lake. Our route started at the Summit Peak Scenic Area, following the Summit Peak Loop: South Mirror Lake Trail to the Little Carp River Trail and finally the Beaver Creek Trail back to the Summit Peak Overlook. Total miles were about 5.2, bringing the daily total to well over 7. Beaver Creek, seen from the boardwalk. It was a gorgeous day! We had lunch (grape tomatoes, sugar snap peas, trail mix, nuts and un-iced iced tea) on a bridge at the end of Mirror Lake entertaining ourselves by feeding the minnows. Important information to know: Minnows are not crazy about sugar snap peas; they LOVE honey roasted nuts and beef jerky; and they’ll eat grape tomatoes if the pieces are small enough!Our last stop of the day was to check out “Overlooked Falls”, doable because they are accessible by automobile! (Cute name, right?) Just a 100 yard walk down the trail, we figured we could make it and not collapse from exhaustion. The falls were very pretty, worth the stop, and a perfect ending to a long, exciting day. Tuesday evening we ate in Ontonagon again – this time we went to Roxey’s and had beer and hamburgers. Interesting clientele – delicious beer! We went early enough to avoid the embarrassment of being turned out of a restaurant that closed before 9. Early enough gave us plenty of time to chase the sunset, scheduled for 9:15pm. 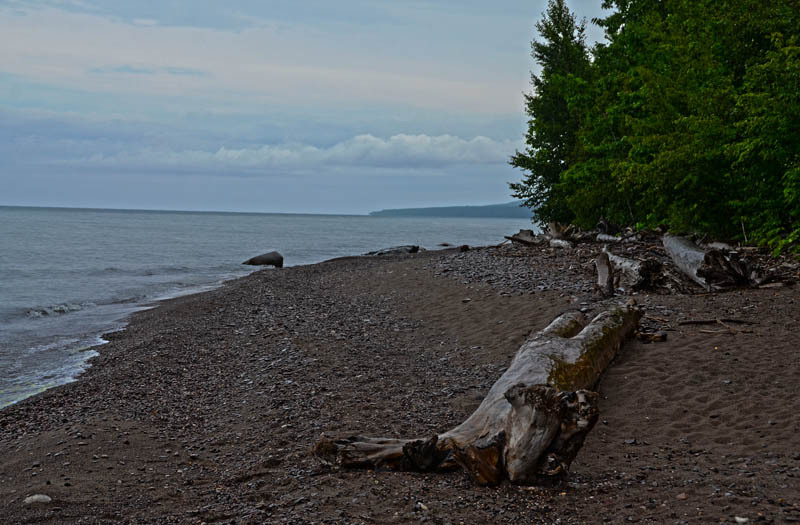 We tried to find a spot by driving east from Ontonagon, up the east side of the bay so we would be looking off to the west, but we couldn’t get close enough to the water without trespassing. So back we went to a public park/campground on the edge of town. 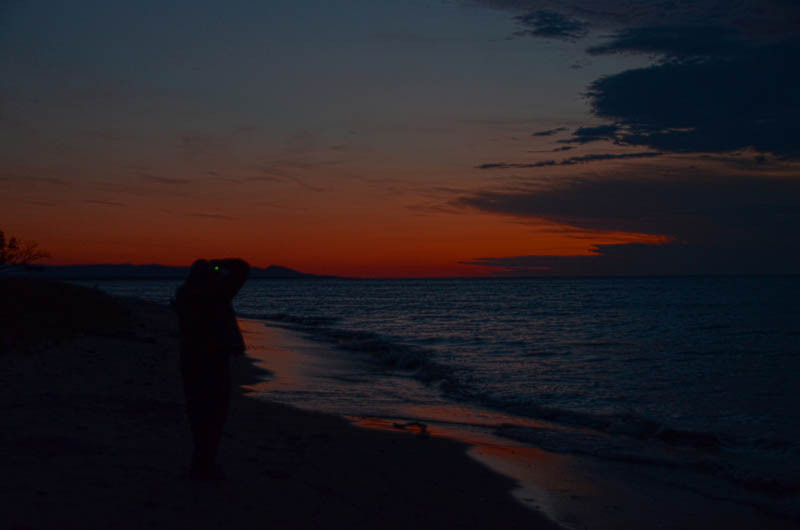 We saw a lot of beautiful colors as the sun went down, but photographically there wasn’t much to shoot. I sat in the sand in front of a piece of driftwood and fiddled around with my colored filters to create something interesting. You can be the judge as to whether I succeeded. 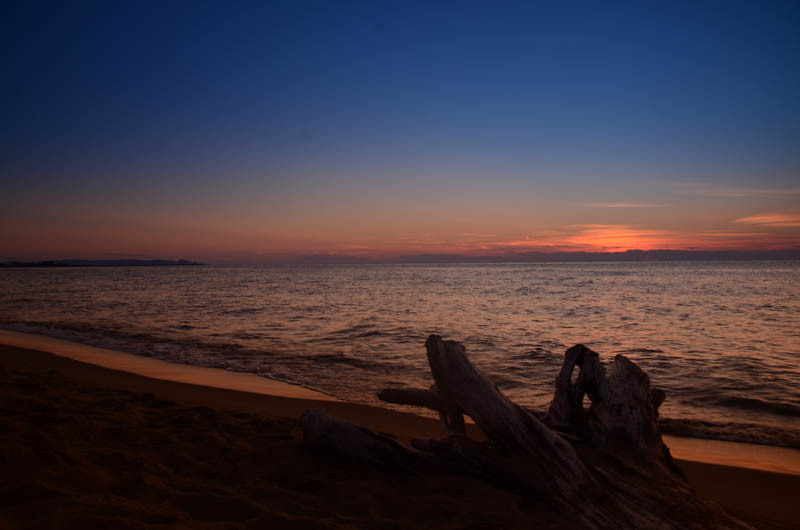 Sunset over Lake Superior on a clear night. Wednesday, we were breakfasted again at Syl’s Café (just give us a couple of seed caps and we might be mistaken for regulars) and then headed to the park for our final day of hiking. Our theme for the day was to be “waterfalls” and so we had two destinations. The first was “Shining Cloud Falls” but on tabulating the mileage required to get there… 5.3 miles each waybeing the shortest route …that plan was postponed for a future visit. We settled then on the second destination: The Presque Isle Scenic Area. One of the many stair cases and boardwalks that keep you from being swept into and down the river. Don’t get confused when you read Presque Isle. 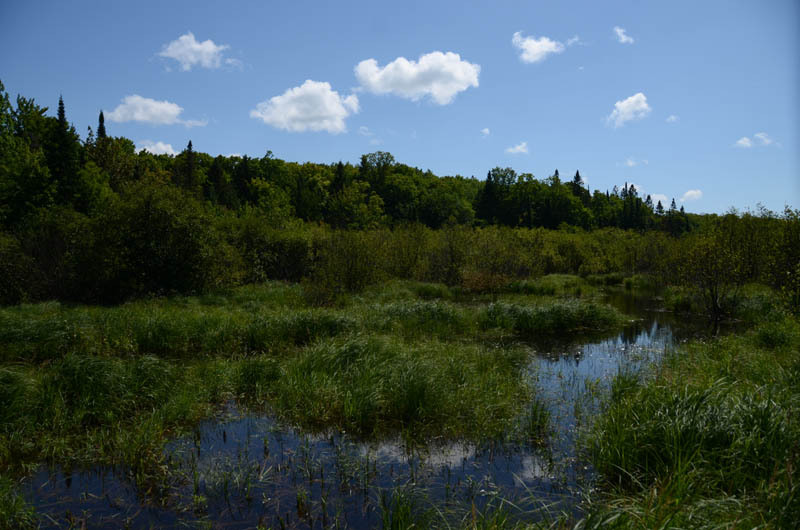 Yes, there is a town in Wisconsin called Presque Isle, but the Presque Isle of this scenic area refers to the Presque Isle River. 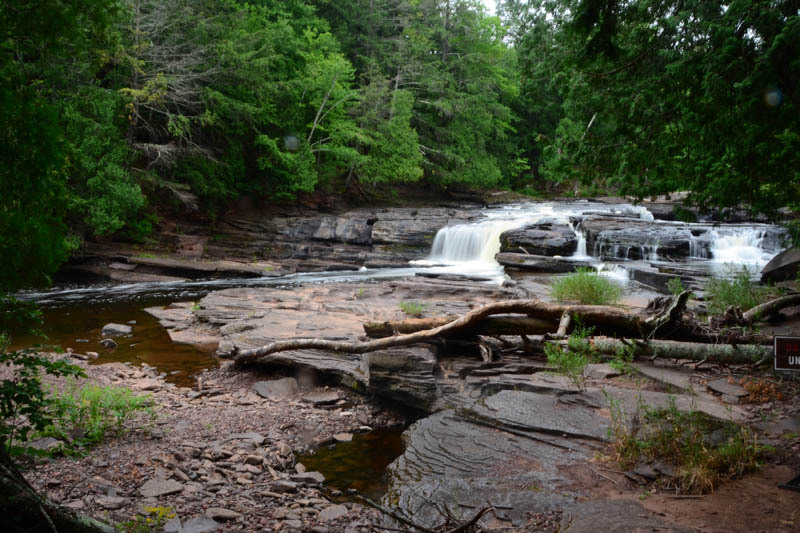 We are still in the UP of Michigan and specifically within the confines of the Porcupine Mountains Wilderness State Park, but now on the far western edge. 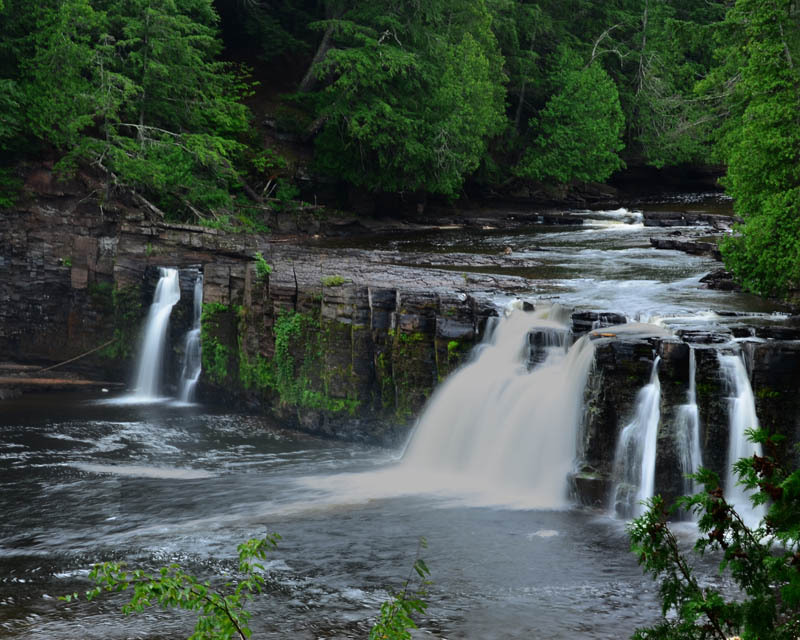 The Presque Isle River races over several courses of waterfalls to reach Lake Superior and a two mile walk should have allowed us to see and shoot (photographically) three different falls. That was the plan. Then it started raining. Now Gerry and I are fairly intrepid and little bit of rain is not usually enough to cause a change in plans, but with no rain gear with us (honestly it looked like it was just going to be one of those overcast days!) the camera gear was going to get pretty wet. We did manage to take pictures between the raindrops. 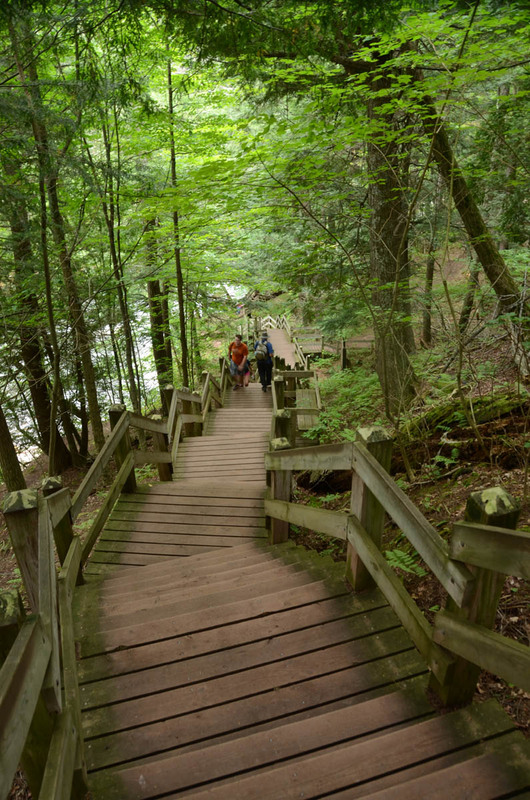 There is an elaborate structure of boardwalks and stairs in the area that provide safe places from which to view the falls, and thankfully much of those were sheltered by trees, so it was possible to stand in a dry area and take pictures. We did venture off the path (highly UN-recommended because of safety concerns) and waited out a period of steady rain, but it really wasn’t a day for soldiering through. We abbreviated our plan to see all three waterfalls and opted for two sets of falls, a bit of the river and the mouth of the river at the Lake. 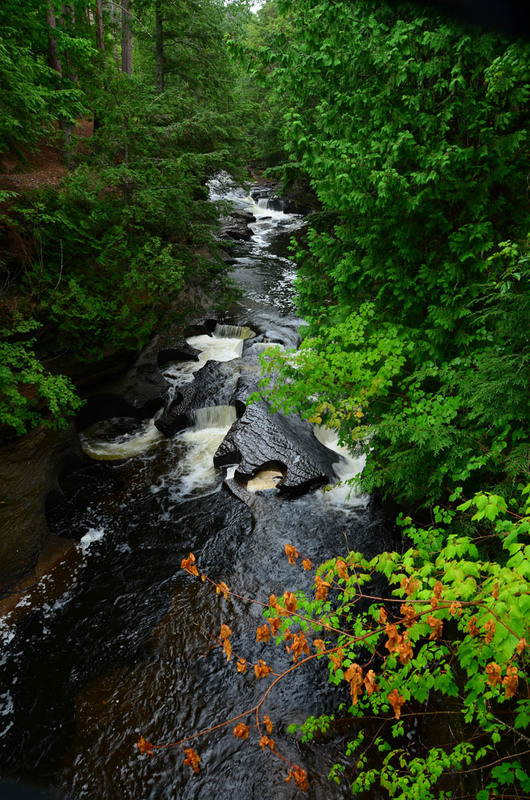 One of many falls in the Presque Isle Scenic Area – beautiful even in the rain. As I look back through my pictures to choose how to illustrate this story, I realize I should mention a bit about the rock in this part of the part. 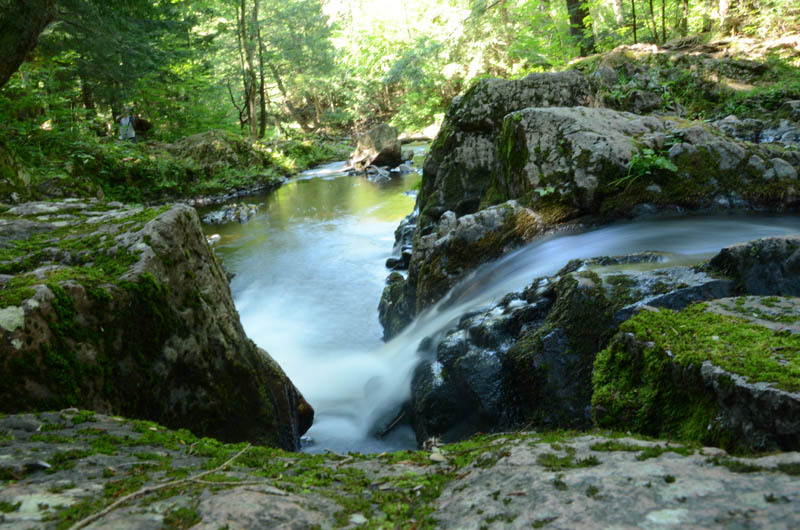 Here the river cuts through a bed of nonesuch shale. You can see in the pictures the layers and layers of rock and the interesting way in which the water erodes them and carves them into elaborate formations. Most interesting to us were the holes – usually perfectly round, though not always complete circles, the holes were formed by swirling water that cascades down from higher areas. Noisy and very beautiful! By this time the temperature was dropping and we were wet and cold and disappointed, so it was time to go back to Wisconsin. Watch for a couple of short extra posts on the remaining days of our last Northwoods trip for summer 2012.